All natural vegan, vegetarian, and gluten free! 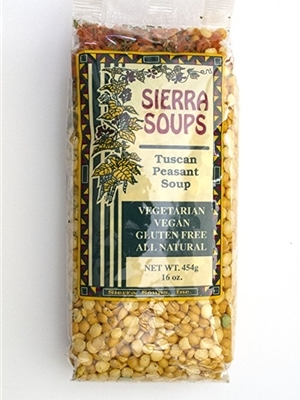 In Tuscany, Italy, this type of soup is traditionally cooked with wild game, but Sierra Soup's version is good with or without the addition of pork or chicken. Our special seasonings add to the split peas' distinct and delicate flavor, to create a smooth & creamy dish. All soups make approx. 8-10 servings. In a large pot, saute onion in olive oil until onions are tender. Add water, bring to a boil. Add soup mix and cook the mixture at a slow rolling boil for approximately 1 hour or until the peas have reached desired tenderness. Add more water if necessary. Salt to taste. Makes about 8 - one cup servings. Add approximately 1/2 pound cooked, diced ham, sausage, or bacon, or other meat of your choice. The meat can be browned in the oil with the onion. Yellow split peas, dehydrated vegetables (carrots and parsley), hydrolized soy protein (soy beans broken down using water), spices.